There’s a lot to be said for the popularity of gothic horror in a mostly-superhero dominated industry. The fact that Jeff Lemire and Scott Snyder have managed to make Animal Man and Swamp Thing still relevant in today’s world, respectively, with fresh takes and interpretations that pay homage to what came before without being carbon copies is admirable in and of itself. The fact they’ve managed to survive this long as gothic horror with a publisher who deals almost exclusively in men wearing spandex and flying around with over-worn underpants is, in itself, impressive. It’s especially impressive that two reasonably high profile writers were willing to stick with a couple of underdog heroes and give them a story that matches (and sometimes exceeds) the best of the superheroes yarns they themselves have written. Usually, for less-superheroey characters like Animal Man and Swamp Thing, you’d get either an indie writer with an awesome idea or some poor, hapless third-stringer who’s given the property to work on by a company who’s only really churning out issues for contract’s sake (something I firmly believe was the case with the Grifter reboot). Somehow the two heroes and their intertwining story is given that much more oomph by having Lemire and Snyder on writing duty, and it’s clear there’s a certain sympatico between the two men that must’ve really come in handy when they put their brains together for Rotworld. It’d been a while since I’d checked out Buddy Baker and Swampy’s adventures back in The Hunt and Raise Them Bones respectively, and the memories of those long-ago days were so hazy that I went back and read them both alongside the two volumes that came after each (and that really says something about my memory, doesn’t it?). If one were to look at the two runs as being trilogies on their own, as well as crossing over between each other, then the middle instalments – Animal vs. Man and Family Tree, just see if you can figure out which volumes belongs to which hero – do a decent enough job of setting up after a year-and-a-half’s worth of storytelling when Rotworld rolls around. As such, since they’re not so much competing as they are contributing similar brushstrokes to the same canvas, it’s time to throw both against the wall and see what story sticks. The eponymous Rot – a force of nature behind all the death and decay in the universe – spreads across the world and encompasses most of the heroes we know and love. 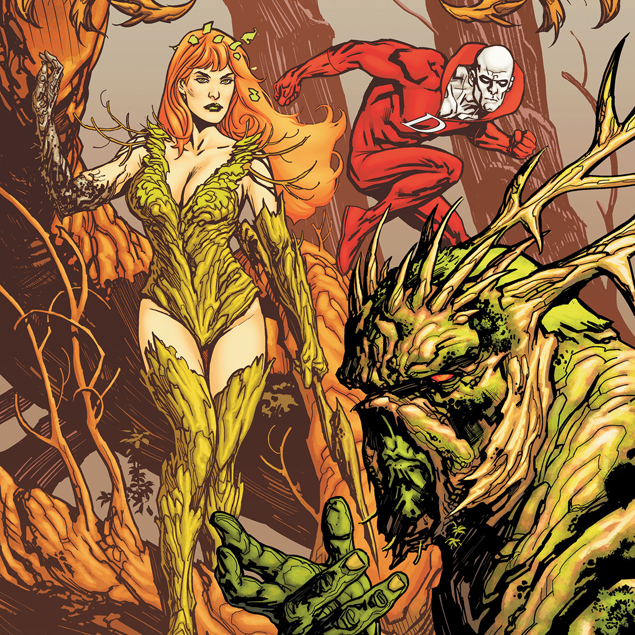 On a mission to stop the Rot, Animal Man and Swamp Thing end up accidentally traveling forward in time by a year to when the planet has been completely infested. Splitting off to their respective Kingdoms to rally survivors for one last push against the Rot and its evil avatar running stuff in the new world, the two heroes separately experience a world where the supernatural forces that give them their powers have been perverted, stomped down and all-but eradicated. As well as that, their loved ones have been turned into gothic horror creature-things that they’ll need to kill in order to save the world. Both books contribute to the larger story the same way the two core books of Blackest Night did, meaning you’ll need to do a lot of flipping between the two to get the full picture. It’ll also be really difficult to get a handle on stuff if you haven’t read the two volumes of each character that come before, so unless you want Wikipedia open at the same time it’s advisable to check them out. 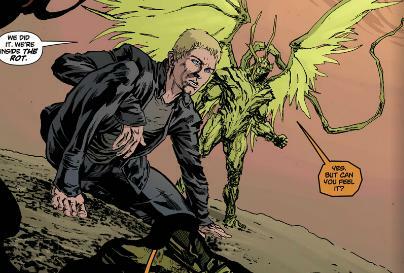 Also, what d’you mean you haven’t read Animal Man and Swamp Thing‘s other volumes? What the hell’s wrong with you? The broad strokes of each book are actually pretty similar, with each hero setting off on an odyssey through their preferred Green or Red region of the world on a quest to take down the Rot avatar. The devil’s in the details, though, and there’s enough variety in each hero’s journey to make them feel like separate stories rather than copy-pasted monomything. 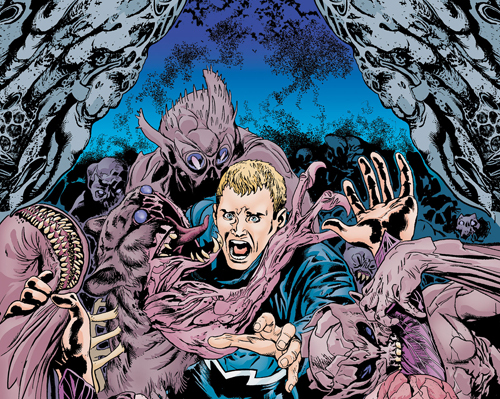 If I had to pick a preferred favourite, I’d probably go for Animal Man’s story; there’s a lot of juxtaposition, between his guilt over him being Animal Man leading to the future they’re enduring, and his drive to fix the Rotworld because, y’know, he’s Animal Man, dammit. 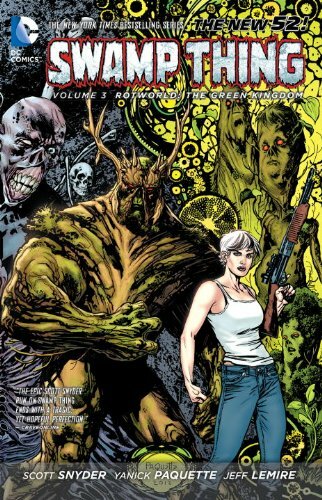 Swamp Thing’s story is no less interesting, but it relies a little too much on a parallel flashback interspersed with scenes of Swampy wrecking stuff, and the content of the flashback is obviously far too little to be stretched out over most of a book. You’ll see what I mean when you read it. Combined, though, the story’s pretty interesting. It’s the culmination of eighteen issues of comic book for each guy, and also the end of Scott Snyder’s Swamp Thing run into the bargain. There’s definitely a sense of closing chapters at the end, and there are enough call-backs and references to past parts of the series to give it a bit of a grand finale feel. The post-apocalyptic tone is definitely there through a ruined world setting and characters dying left, right and centre. I think Rotworld will prove to be a divisive story that will be either condemned or vindicated by time; the narrative itself is pretty fantastic and I had a lot of fun with it, but there’s enough weird (and annoying) stuff that happens to make fans a little wary about the direction going forward. The place our deuteragonists are left at the end of each book opens a lot of possibilities of where to go next, but if they’re not taken well enough then the whole effort’s banjaxed. Part of the books rely on time travel as a plot device to fix things (but really, if you expected the world to remain permanently screwed at the end of it all without hitting the reset button, then clearly you don’t read comic books) which I’ve heard already annoys some people for being incongruous to the tone of the books. I can kinda see why that last aspect would piss people off, especially as it’s used towards the end to try and repair the damage the Rot has done. Like I said, though, for a world this buggered and the sheer body count of named superheroes you’d be kidding yourself if they didn’t mash that reset button by story’s end. There’s a major and a minor gripe I have with the story that casts a whole umbrella over the effort. The minor is that we’re only treated to seeing the United States under the thrall of the Rot, giving us West and East Coasts riddled with mutated plant life and animals that wouldn’t look out of place shambling along in a Romero film. I’d’ve liked to see more of a worldwide view of the contagion, especially considering DC’s got heroes in international locales that would’ve looked awesome fighting the Rot as it seeps outwards. It feels like it’s less Rotworld and more Rotmerica in some places, but as I said this is a minor gripe. My major gripe, though, overshadows that entirely. 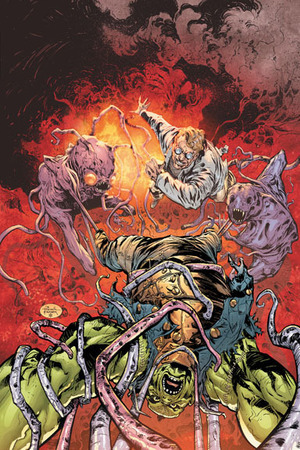 Without wishing to actually spoil, the final solution to cure the Rot – which is discovered and implemented during Swamp Thing’s part of the story – is unlikely. No, sorry, that’s the wrong world. It’s insane. It involves a plan Batman came up with which, unless he’d spent as much time as Animal Man and Swampy had exploring the Red and Green respectively, would be absolutely impossible for him to prepare for. I understand that Batman’s meant to be this hyper-prepared, super capable hero, and far be it from me to say a plan he came up with shouldn’t be possible to think that far ahead for, but there’s just no way he could’ve predicted this. At all. You can’t tell me Batman can spend a year fighting off a court of owl-theme assassins, breaking a large hadron collider and chillin’ out with his son amongst all the other day-to-day stuff he’s got to do and come up with the overly complex plan he formulates to combat the Rot. I’m sorry, but as much as I love Batman I know there’s no possible way he could come up with that – and if a story wants to make me realise there’s something Batman can’t do, that’s clearly an instant fail in my books. More seriously though, the fact that part of the final plan hinges on a hitherto unseen thing Batman cooked up does reek a little of deus ex machina to a degree. Granted, it doesn’t entirely solve the problem but it does carry a lot of weight in the final battle and actually gives the good guys a shot at taking down the Rot. This is Animal Man and Swamp Thing rather than a story involving any Batman title, and it feels a little disingenuous to rely on my favourite superhero in a story he’s not even featured in. And no, having Scott Snyder (the current Batman scribe) on writing duties for Swamp Thing, as well as having Swampy lampshade in-story how unlikely it was for Batman to conceive this plan, doesn’t make it better. Those gripes aside, it’s still a damn good story. In addition to some great narrative we’ve got truly excellent artwork, though once again I have to take a few points away. 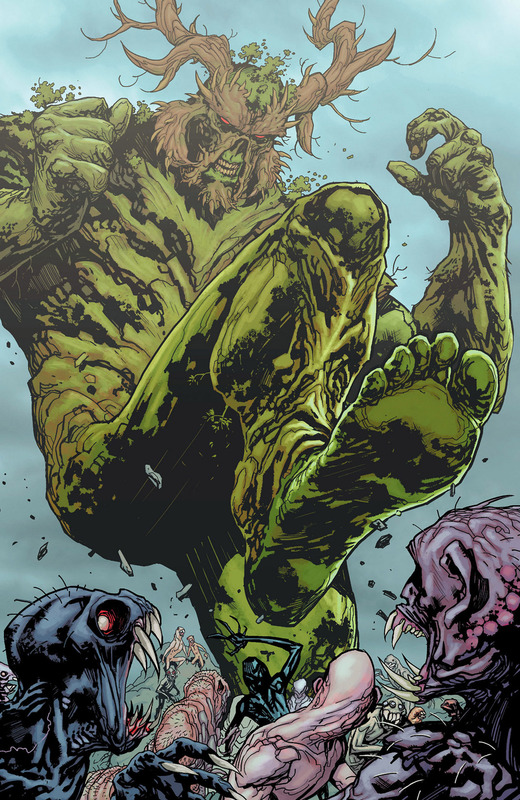 On Swamp Thing, long-time artists Yanick Paquette and Marco Rudy keep their flow going with the thick pencils, dark shading and macabre palette they’ve had since Raise Them Bones, and the consistency of the artwork really gives the story some extra punch. Some of Paquette’s panels throughout can get a bit confusing to read since they rely more on elliptical or oval shapes rather than the traditional square rectangle form, and having some of them go cross-page can muddy the narrative flow a little. Not a huge problem, but you may want to read a few pages more than once to get the whole picture (no pun intended). 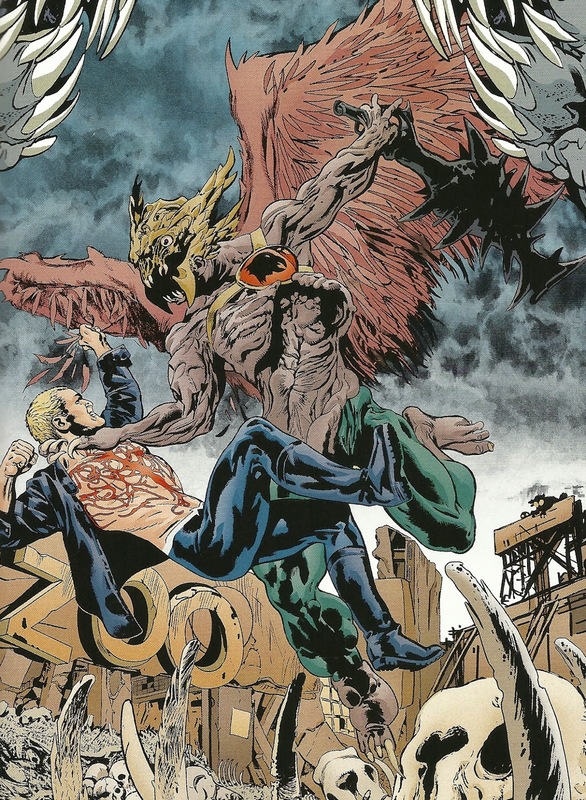 Animal Man‘s art, however, is a problem. Travel Foreman, the artist behind the twisted and grotesquely beautiful in The Hunt, is gone, and his replacement Steve Pugh just doesn’t cut the mustard for me. Pugh did an ok job on Animal vs. Man before this story, but here his artwork feels particularly out of place. It’s a bit more esoteric and full-lipped than Foreman’s, taking away some of the supernatural twist that really appealed to me back in the first volume. I loved the French-inspired freakiness of The Hunt, with distorted bodies, thin pencils and a magnificent twisted colour palette. Pugh’s work in Rotworld just doesn’t have that feel to it, which is particularly annoying since the entire environment of the Rotworld is crying out for the messed-up art style of Foreman. Would’ve livened up the story to no end. Pugh’s not a bad artist here, but the book could’ve definitely benefitted from Foreman’s input. Also, the penultimate chapter of Rotworld ditches the artists mentioned above to use some illustrator we haven’t seen up until now, and the very distinct shift in art style is clunky and unnecessary. It’d be bad enough for an illustrator with completely different tone to appear randomly in the story, but it’s particular egregious as what is effectively the end of the story draws up. It’s a shame, because narratively that chapter’s pretty excellent. Scriptwork is pretty good. Lemire once again takes preference for having Animal Man and his buddies have some pretty good dialogue, even if a decent amount of the snark is gone. Snyder does a pretty good job with Swampy and his allies, even if at times the Parliament of Trees can delve into the old exposition trap of telling the audience everything and showing very little (particularly bad in a comic book which is pretty much all showing). The biggest highlight for me is John Constantine, who pops up during the Animal Man portion and has some really great dialogue going on with both the title character and his own allies. Hearing that Lemire’s the current writer behind Justice League Dark kinda makes me want to check it out right now, coz his Constantine’s fantastic. At the very least it erases Keanu Reeves’ voice from my head whenever I see him. Rotworld is not a perfect story, nor even a perfect crossover – from a manufacturing standpoint the story would’ve benefitted from being printed in one volume, rather than swapping out between two – but it’s still pretty damn good. 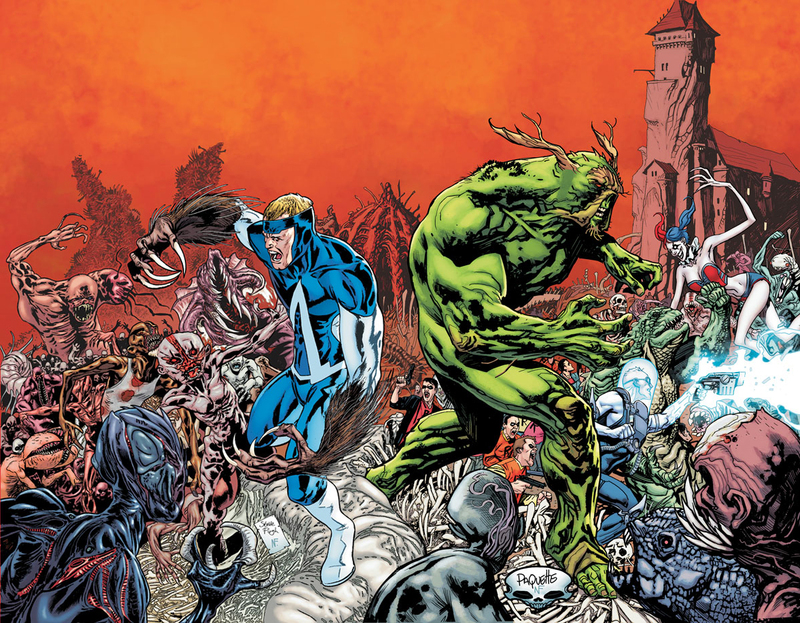 Part of the ending to the Rotworld setting is predictable, but that’s compensated by the personal endings for each hero, and the aftermaths of both, being compelling and putting both Animal Man and Swamp Thing in very different places going forward. As I said, the broad strokes are similar but the details differ, and that’s where a lot of the satisfaction lies. I would not only recommend reading both The Red Kingdom and The Green Kingdom together, but also doing a marathon of reading Volumes 1 and 2 of each run immediately beforehand; there are enough call-backs that unless you have the entirety of both stories committed to memory, you might be scratching your head a bit. 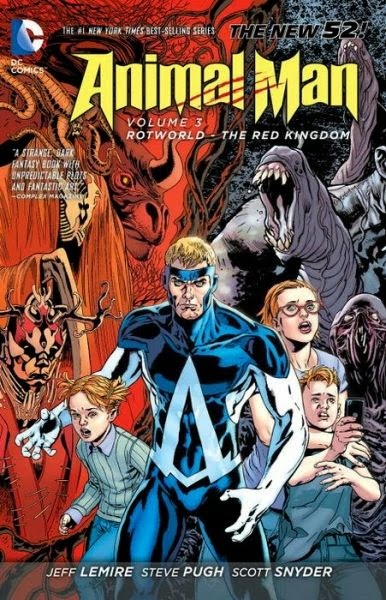 One final note: I’d like to apologise for all that I misled with my review of The Hunt last year by saying that Animal Man was Canadian. Don’t ask me where that came from, but he’s definitely American – from San Diego, to be precise. Maybe I was just really hankering for DC to give us a series that isn’t about an American spandex-clad parkour expert. Projecting too much, yet again. BEST QUOTE: Unfortunately I can’t provide best quotes for either book this week; most of the stuff I really enjoyed involves spoilers. Suffice it to say that the dialogue’s damn awesome in both books.